Reception and kitchen with a common room is under video surveillance for your safety and ours. Respect other guests and treat them the way you would want to be treated by them. For deliberate damage to the property or theft you will be fined with the expense of the damage. For property damage the guest responsible will be fined with the amount of the repair or replacement. 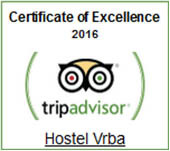 Our hostel does not hold responsibility for the loss, theft or damage to your personal belongings. 1. Every guest is entitled to a free bedding and a towel. After a 5 day stay, the towel and bedding can be replaced at the reception free of charge. 2. We do not hold responsibility for personal injuries of our guests. 3. The consumption of alcohol on the premises is forbidden. 4. No food outside the kitchen is allowed. 5. Drugs and weapons are strictly forbidden on the premises of the hostel. If found we are entitled to confiscate them and call the police. 6. Please always carry the key to your rooms with you. A lost key will incur a charge of 15€. 7. No visitors are allowed in the hostel if the receptionist isn`t aware of the visitors. 8. If you did not pay and check in you are not allowed to stay the night in the hostel. 9. The room you booked will be waiting for you until 9 pm in the evening. If you do not arrive until 9 pm and you don’t notify us in advance, this will count as if you cancelled the booking and the room may be rented to another guest. We can charge you a whole amount of the booking. In case of a late arrival without the notification in advance we will try to offer you an accommodation within the available capacities. 10. We ask you not to damage, remove or change the layout of the furniture in the rooms. For every deliberate damage or removal we will claim the compensation for the cost of the damage. 11. Kitchen is open for all guests of the hostel. After every use wash the dishes and clean the cooking area. 12. Please mark the food and drinks you put in the refrigerator with your name, your departure date, otherwise it will be discarded. 1. Smoking is forbidden on the premises. 2. The use of electric heaters, stoves and other devices that produce heat in the rooms is forbidden. 3. In the case of deliberate and/or unnecessary activation of the fire alarm, or if the alarm is activated because of smoking or forbidden electric devices, you will be charged with the cost of the fire intervention. The owner, manager, staff and security have the right to check the following of house rules at any time without the permission of the guests. If you need additional information or explanation, please contact the reception.